Food Costs > How Much Do Crab Legs Cost? How Much Do Crab Legs Cost? Crab legs are popular seafood choices in many American dishes and are especially famous for most seafood restaurants, being used as the main ingredient for many seafood dishes. Although most crab legs come from the Alaskan King crab, they can also come from other types of crabs like snow and blue crabs. Crab leg prices are going to greatly vary from region to region, the current market conditions and it will also depend on the type of crab leg you are going to purchase. Near the coast where crab legs can be purchased fresh, the costs will be much cheaper than those who live a few hundred or thousand miles away. Most of the time, it is best to budget anywhere from $10 to as much as $30 per pound. The cost via an online store will usually be higher than your local grocery store. 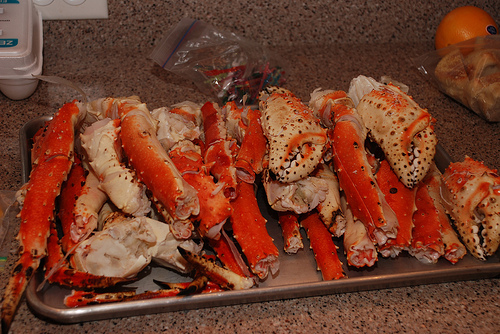 For instance, Great-Alaska-Seafood.com sells four-pound wild Alaska giant king crab legs and claws for $179. Their colossal king crab legs and claws, on the other hand, sell for $429 per 10 pounds. At Sam’s Club, a 10-pound box retails for a pinch more than $110, bringing the average cost to about $11 per pound. The 32-ounce Member’s Mark snow crab legs and claws retail for about $21. If available, the price per pound, outside of these two items for fresh crab legs, would be about $25 per pound. Walmart offers premium Dungeness crab in 16-ounce bags for close to $17, while a 1.5-pound box of cooked snow crab legs retail for about $20. Kroger quoted $24 per pound for 16/20 wild caught king crab legs and $32 per pound for 9/12 wild caught king crab legs. Snow crab leg clusters were about $11 per pound. On Amazon.com the highest rated retailer that sells a five-pound box of king crab legs charges about $125 for a five-pound box. FatWallet.com claims that if you can get crab legs for less than $15 per pound, it is a fantastic deal; however, they also claimed that you should be prepared to pay as much as $30 per pound depending on the distributor and quality. If you order crab legs in a restaurant setting, you will most likely pay $20 to $50 for a dinner portion. Crab legs will be processed in various ways. If you buy fresh from the docks at a fish market, for example, then you can simply pick out the crab legs you want from the counter, throw them inside a plastic bag and leave. However, if you were to buy at a local grocery store, which are commonly either snow or king crab legs, then it will either be prepped inside a plastic wrap sitting on a styrofoam tray or if you were to buy in bulk, the legs will be shipped frozen and wrapped in a bubble wrap that’s placed inside of a cardboard box. In some cases, grocery stores will often hold seafood events where you can purchase the legs fresh as if you were at a fish market. Crab legs will be graded in sizes that are able to indicate how many legs will compromise a unit of 10 pounds. If you were to see a number such as 9/12, for instance, then this means nine to 12 legs per 10 pounds. Aside from these numbers, you will also see the terms extra small, medium, large, extra large, jumbo and super jumbo. The larger the size is, the less you will get per 10 pounds. Regardless of how you purchase, they can be consumed either hot or cold by either steaming, boiling, baking, grilling or even microwaving for as little as five minutes. Almost all of your crab will be cooked at sea where they are caught and will be flash frozen on the fishing vessel to help protect the flavor. A crab shell cracker will be needed by those who have difficulty opening the shells. Most crackers will cost no more than $10 to $20 for a set. While optional, sides to serve with crab legs are recommended. This may include vegetables, a salad, green beans, Brussels or sauteed spinach. Crab legs will be frozen before they even reach you. As a helpful tip, thaw out the crab legs in the refrigerator before consuming them. Most cooks do not advice thawing it with warm or even cold water as it will affect the taste. When purchased, it can retain its flavor and freshness for up to two days as long as refrigerated. After cooking, refrigerate within two hours. If freezing, place the cooked crab inside of a heavy-duty freezer bag or an airtight container. The two most common crab leg varieties sold are the king and snow, so what’s the difference between the two? For starters, king crabs can grow much larger, up to 25 pounds, whereas a snow crab will max out at about five pounds. Secondly, the king crab is known to have a “richer” flavor when compared to a snow crab’s taste, even though it does have more meat. As for the look, the snow crab legs will be straighter, the shell is softer and there won’t be as many sharp protrusions on its side, making it easier to crack through. Consider checking out your local wholesale clubs such as Costco. Here, you can often find quality crab legs for as little as $10 to $15 per pound. Local Costco had $17 per pound.